The new Eurostar route made our trip very easy. We took a train from London to Rotterdam and we arrived at the heart of the city. 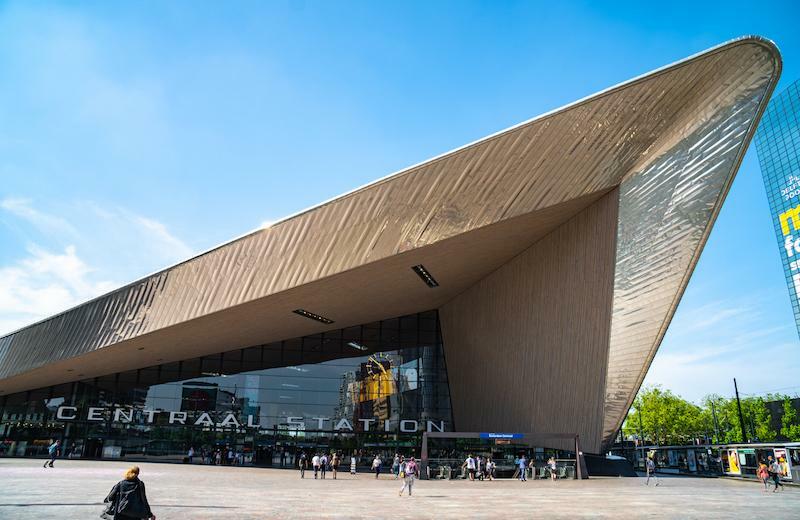 The iconic architecture of Rotterdam Central Station and its triangular shape is a must see even if you don’t travel to the city by train. 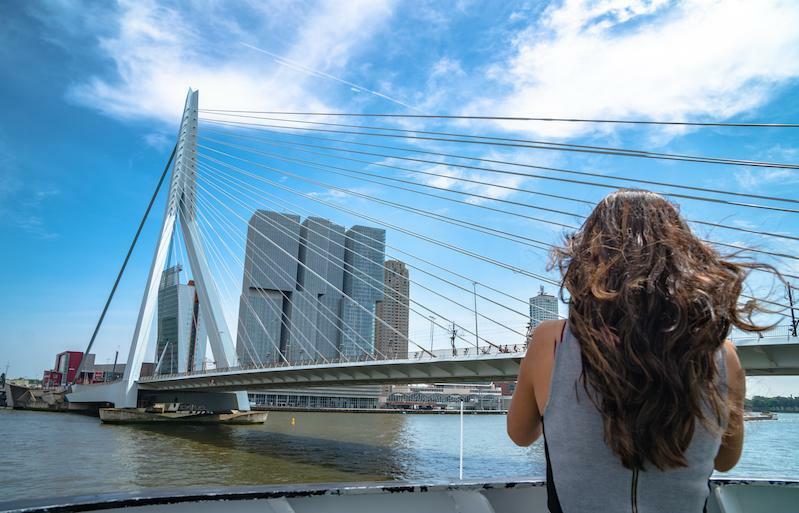 The very first thing that made us love the city was the Erasmus Bridge, the most famous and beautiful bridge in Rotterdam. We crossed the bridge by walk many times, while other people choose to use cars, trams or cycle around. The bridge is size and length are quite impressive and there are cycling lanes and pavements on both sides. 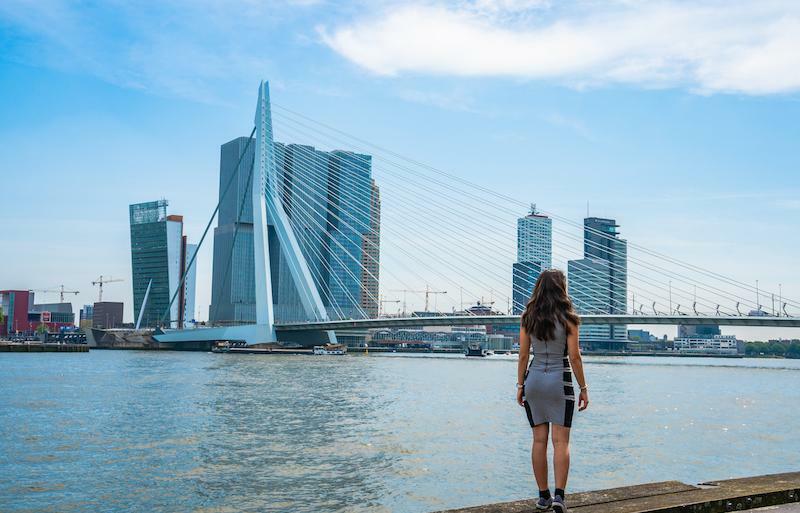 Rotterdam is not far from the North Sea and it is located at the mouth of the Nieuwe Maas channel leading into the Rhine–Meuse–Scheldt delta. So, you can imagine how the water can add to the beauty of the city. We enjoyed having breakfast by one of the canals every day during our stay. Moreover, there are some restaurants, bars and cafes on the riverside. On the day we were exploring the city, we decided to stroll walked through the Flag Parade which is next to the main river. It is a collection of all nations around the world. I and Bruno played the game of recognising the flags of the countries we travelled to or we currently wish to travel to and of course, we spotted the flag of Iran (my home country) and Italy (Bruno’s home country). 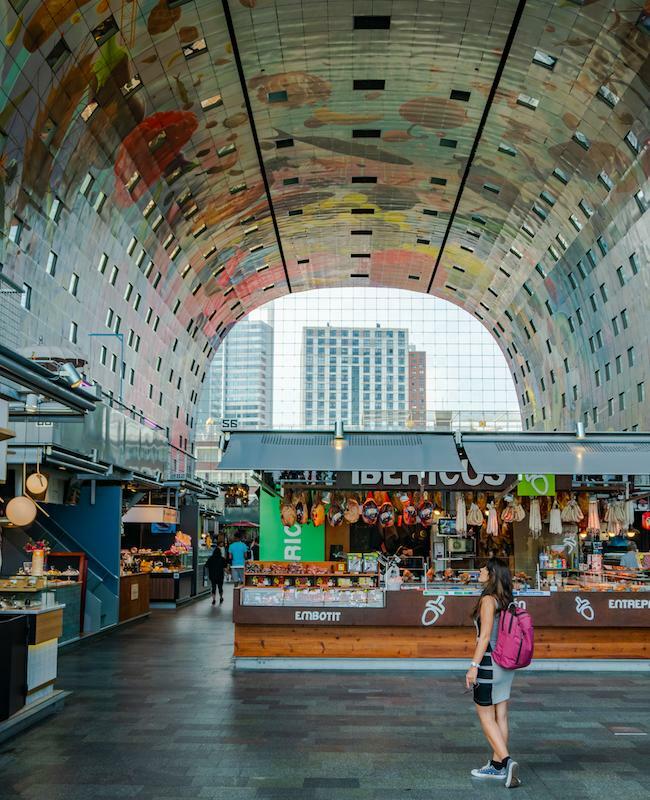 Markthal is a must place to visit when you are in Rotterdam. The indoor market which opened in 2014 has become one of the main attractions and popular places for gathering in the city. From the outside, we could see how huge the building was, and as we entered the market we both were really impressed by the amazing murals on the arched ceiling. You can find fresh vegetable, food, fish, meat, nuts, cheese and drinks in the market. Above all, there are some restaurants or even stalls which sell prepared food. We chose to have lunch there on our last day and I should admit that it was a very good decision. 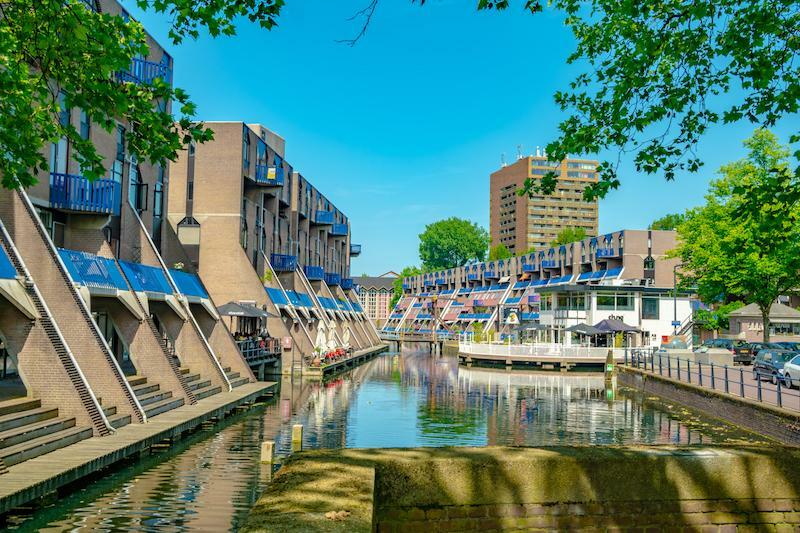 You can walk from the market to the Cube Houses, which were designed by Piet Blom, a Dutch architect. 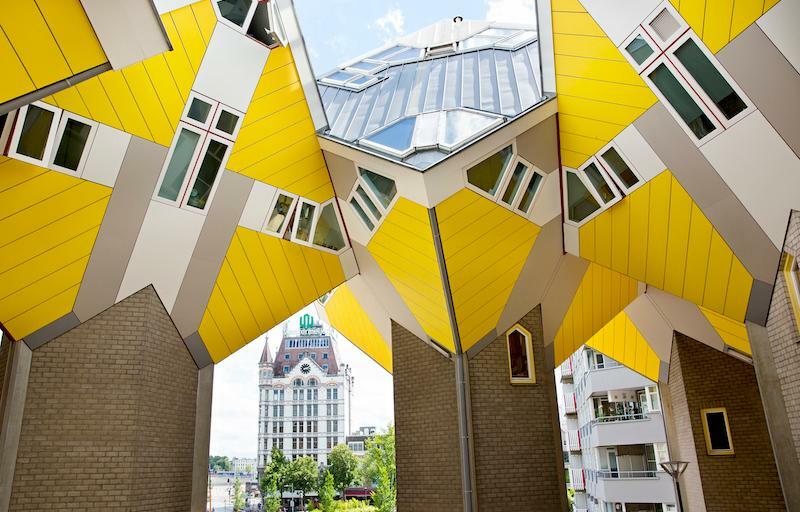 The unique and weird design of these houses attracts a lot of visitors from all around the world. You can take photos from the outside or go inside one of them, called Kijk-Kubus (Show-Cube House). 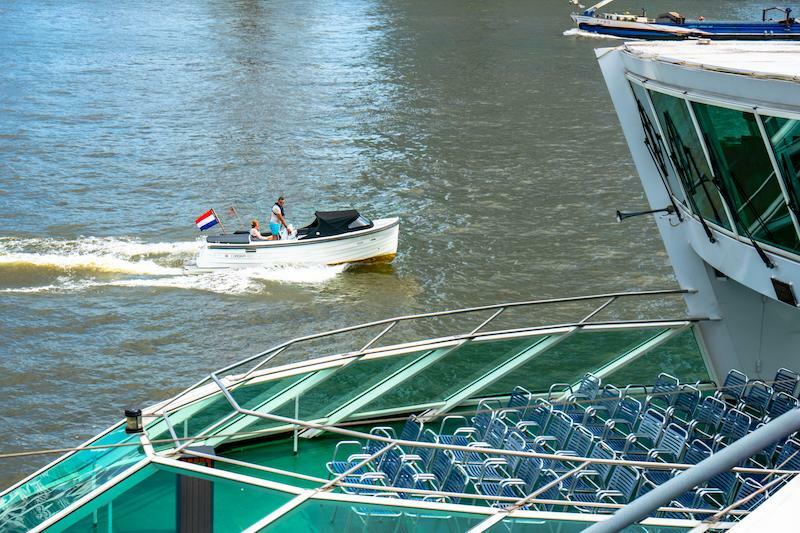 We always enjoy taking a boat tour in the cities, and we did so in Rotterdam. We took the 75-minutes Spido Harbor Tour. It was a warm and sunny day and the tour was not busy, we had a romantic trip while learning about the spots we saw while passing through. The boat took us to the port and then on the way back we saw the biggest ship ever built in the Netherlands. We didn’t have time to take the dinner cruise tour, but I can imagine that it would be cool to have dinner on the river. 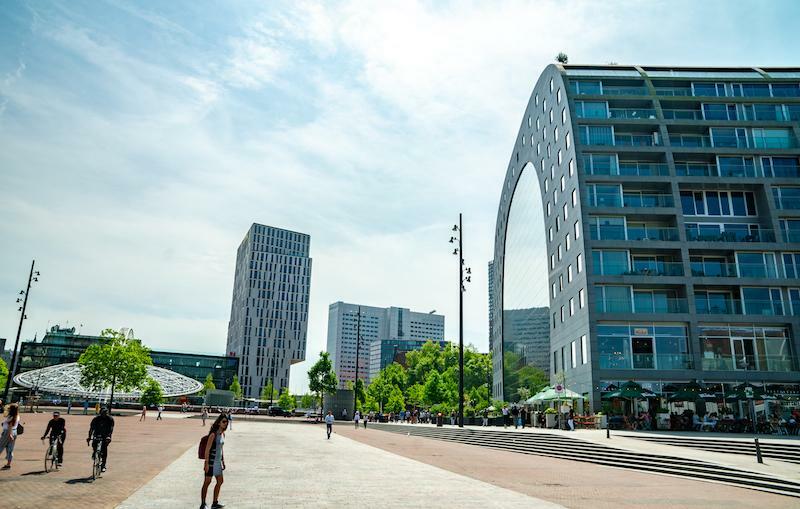 When you are in Rotterdam you must stroll around the city, it is unlike other European cities, it has a modern style and striking high buildings. You can go around by walk or rent a bicycle like the locals. 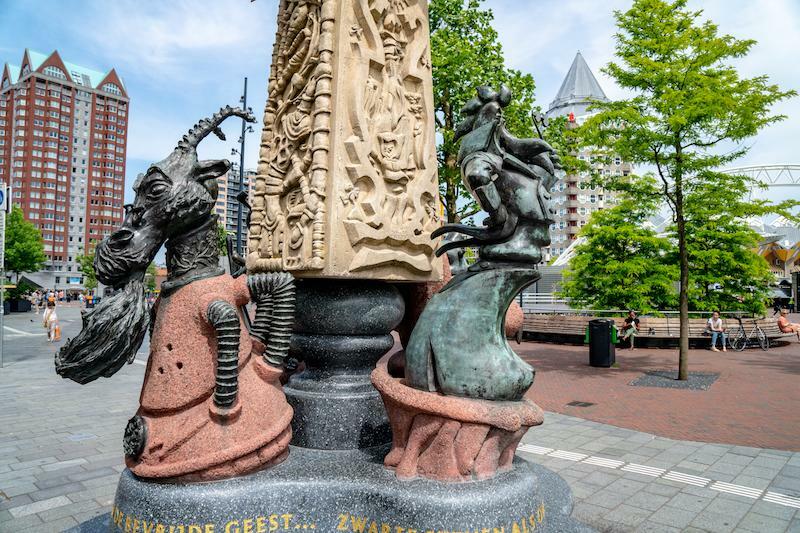 Please let me know in the comments if you’ve already been in Rotterdam and share your own suggestions and places to visit.